Modern Classic with a touch of elegance. Mix and match in a modern pallete for this autumn season at LuLLiLu. LuLLiLu’s Red, Black and Snow White Merino blouse will make a brilliant addition to your workwear wardrobe. Tuck this fine soft knitted blouse into a LuLLiLu Pencil or A-line skirt, to complete a perfectly put together, ladylike look. LuLLiLu knitted blouses are made ethically in 100% Extra-fine New Zealand Merino Wool. Merino Wool is the finest and softest wool that is easy to maintain and feels smooth against your skin. ENTER New10 FOR YOUR 10% THIS WEEK ONLY. Lullilu’s Gypsy blouse in Cameo Rose and Crystal grey are a romantic twist in a fine knit. Gently gathered details at the neck and Lullilu’s signature hint of a bell sleeves lend this romantic blouse an effortlessly cool look when styled with our Paige Verdugo skinny jeans. Enter New10 for 10% off your entire order. 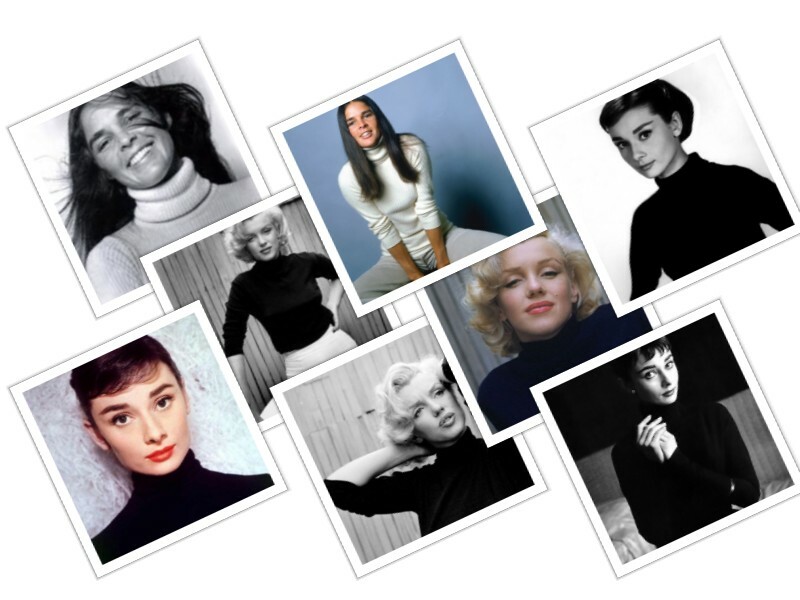 ✿ Iconic Fashion – The Turtleneck Jumper ! Ali Macgraw, Audrey Hepburn and Marilyn Monroe are icons that have all been captured wearing the turtleneck jumper. The turtleneck is a classic and timeless that just oozes with elegance and simplicity and will be high on everyone’s list this season. Featuring ribbed body and Lullilu’s puff sleeves , in Vintage Rose, Luxurious Cream, Delicious Toffee and Classic Grey, this will become a key wardrobe essential. 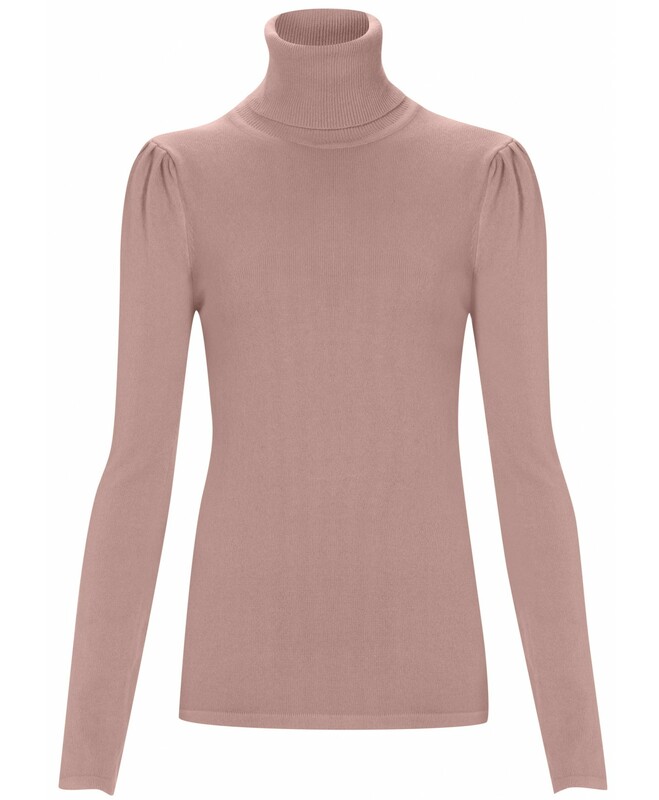 Vintage Rose luxurious cashmere turtleneck complete with Lullilu’s signature puff sleeves. Oatmeal Melange 100% cashmere turtleneck complete with puff sleeves. Perfect for everyday wear is our luxurious blend of cotton, wool and cashmere turtleneck in Cream. Our Delicious Toffee Ribbed Turtleneck Jumper ! Our Classic Silver Grey Ribber Turtleneck! We hope you love this classic as much as we do and get purchasing whilst stocks last ! A common question is where does our cashmere come from? Lullilu’s cashmere comes from the Capra-Hircus Goat which lives high in the Himalayan Mountains and on the cold high level plain of Mongolia and Inner Mongolia. The outer fur actually feels rough to touch. Certainly if you were to stroke this goat it wouldn’t feel amazingly soft. The finest hair is on the inner layer, next to the skin. The cashmere production and manufacture for Ronit Zilkha’s cashmere collection is in Kathmandu, Nepal. Using the finest cashmere yarn from Mongolia, where it is spun prior to being shipped to our facilities in Kathmandu. The clothes and scarves are made on hand machines – a labour intensive and skilled process. The factories employ and train mainly female workers and garments are all assembled and finished by hand. Ronit Zilkha cashmere collection for Lullilu is an environmentally aware company using local materials where ever possible and ensuring that their workers are well paid and have good working conditions. We can feel the Winter coming already (Brrrrrr!!!) So what perfect time than now to stock up on some quality cashmere cosys! Meet out luxurious Vintage Rose cashmere sweater. A classic shape and colour that will never go out of style. This will become a key piece all year round as the thing with cashmere is that it keeps you warm in cool climates and cool in warm climates. Not just a pretty face? Handmade from 100% cashmere this turtle neck sweater in vintage rose and oatmeal melange is high on anyone’s wishlist. Complete with Lullilu’s signature puff sleeves this is perfect for everyday wear and will become a key essential to your winter wardrobe. Worn with a skirt for a sophisticated look or with our Paige Twilight Jeans for a modern chic look. The Cashmere Audrey Dress is the perfect day dress. It’s simple yet flattering and easy to wear. We recommend wearing with tights boots and one of our cashmere scarves. Scarves are a perfect accessory for the winter and can add a splash of colour to your outfit. New to LuLLiLu is our handmade Vintage Rose cashmere fringed scarf. Made from the finest luxurious cashmere, this sumptuous scarf will be a statement piece for this fall trends. Be bold and enhance any look with our Rich Red cashmere fine scarf, also handmade from 100% cashmere we guarantee you will stylishly stand out in any crowd! The brand Paige created by Paige Adams-Geller was born and raised in Los Angeles. Paige combine Southern California casual with pure sophistication. Made using the highest quality materials. As a top fit model for denim´s heavy hitters Paige acquired cunning knowledge of fashion and an acute attention to detail. With a commitment to cutting edge design, Paige Adams-Geller set out to launch a denim line that would offer sophisticated and trend setting styles. We have stocked up on our two most favourite pairs of Paige Jeans that you will love and wear until your hearts content. The ‘ Verdugo Twighlight Skinny Jeans by Paige ‘ . Verdugo Skinny Jeans by Paige is designed for the modern woman. At Lullilu we love the Verdugo , Paige’s bestselling skinny. With its no–fuss cut and flattering mid rise, its a smart essential Jeans and teamed up beautifully with our Tie neck top for any staple wardrobe. 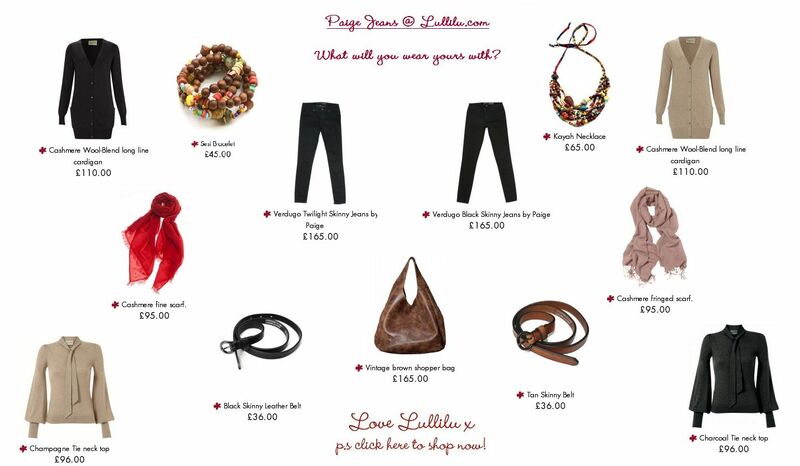 See our favourite LuLLiLu items that you can team up with the gorgeous PAIGE JEANS! What would you wear yours with? Our best seller from our collection is the Tie Neck Knit Top (As seen in Style Magazine )! A beautiful bell sleeved knit, made from quality materials in 3 gorgeous colours – Charcoal, Silver and Champagne. You guys loved it so much that we have decided to make it into a dress! So here it is .. Introducing to you The Bell Sleeved Dress. We’ve kept the original colours and the bell sleeves and added some elegant cut out detail around the neck! This beautifully cut dress is made from a natural knit blend of cotton, wool and cashmere. A flattering and comfortable essential piece that is a must have for this season. 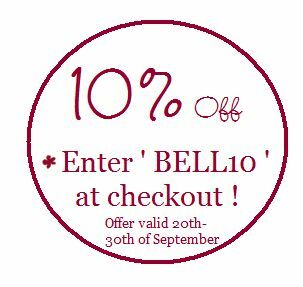 sign-up to receive the lullilu newsletter and get 10% off your first order.